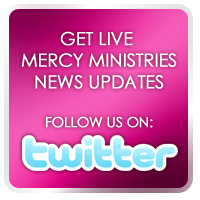 Mercy Ministries News: Graduate Chosen for Makeover! Anne came to Mercy Ministries in 2006 with an eating disorder. She has walked a long road to freedom from her life-controlling issues, but now finds her hope and her joy in Christ. Not only has she experienced a transformation in her heart, but she recently had the awesome opportunity to be outwardly transformed on Good Day Wisconsin’s Monday Morning Makeovers! After writing in to her local morning television program, Anne was chosen to participate in a fun makeover day at Haven Salon and Spa in De Pere, Wisconsin. The makeover artists pampered Anne with a manicure, hair coloring and style, and a cosmetic session that transformed Anne’s style. Anne was very excited to get this fresh start right before beginning nursing school. “I loved it,” she said. “This is something I have never done before, but it has been really exciting and super fun!” After the makeover, Anne was also featured on television with her “before and after” pictures. Check out the video below. Congratulations Anne on your fun day at the spa! We are excited to see what God has in store for your future!